I've shown this chart before, because it works so well. It's a 240 minute (4 hour) chart of the DJIA. If you insisted on one stand-alone chart for all of your timing, I'd be hard pressed to suggest a better one then the one above. As of today's open, it will take about a 65 point drop from current levels to flip the trend from up to down. Four hours is a long time, an eternity in futures and/or options, so this may not be practical for short-term trading. But it is an effective compass for directional purposes, which if you think about it, is holy grail enough.........until something better comes along. 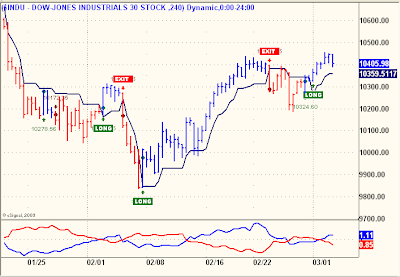 Just curious if you had the chance to review the trend indicator published in this months edition of S&CM? It looks like it might have promise working with the ATR indicator. Are you referring to Empirical Mode Decomposition? wave trend is corrective down. key s/r currently is that 1.25 point. and thats where those previous multiple touches of s/r at 1.16 and 1.12-1.10 comes in. NNVC needs this correction in order to move higher. I personally would consider this as a possible good buy entry play zone. especially for those who do not own any NNVC. the days of past price at 70 cents and 50 cents are far away in the past. Not to say they cant be revisited at some point...but right now, when watching price action, wave action, timing the market cycles, etc...looking for a high probability set up for buying (or selling) .... the time to 'sell' nnvc was days ago when it hit 1.38.
the time to buy based on current price action technical analysis would suggest any sharp(thats the key) sharp sudden hard move down into the 1.12 area might offer the Bounce factor good for a strong reversal at this key timing cycle zone for Reversal energy. while NNVC might be a 'good bargain buy' at 1.10...there IS a real possibility that price could fall to a lower support level ,like 1.06 or 1.00 and at some point in the future even to test the .90 area again ,and into the .80's for the greater bottom support. Playing the odds here and now, means, seeing the CURRENT price action ,and technical analysis, which says IF this happens,sharp drop to 1.10, then That spells good timing for a WHIPSAW reversal entry point going long. sellers bail and drive NNVC sharp drop down...not a wishy washy decline,a sharp plunge the kind that happens when key support level is breached . sharp drop to 1.10 area ..... is a buy for traders and speculators and first ok buy entry point for those who dont own any at all yet. After this trading zone expires . There could be better and lower price entry points at or below 1.00 s/r and .90 cents. s/r some other time. but maybe 1/3 or 1/2. ......................... I Had already looked at Elliott wave counts ,and on many time frames from weekly thru the 10 day/10 minute charts. but I could take another look. I think I had mentioned the other day, about an elliott wave pattern the current one for NNVC showing the wave 4 happening now,with potential for wave 5 going up thru the 1.37 to make new high completing 5 waves at (pick your target) 1.40 -1.50 or higher as others estimated the 1.70 area ?? you want to look at fib levels for where wave 4 could drop to.? Must I do that? anyone can do that. wave 3 went from where to where. whats a 50 % 38% 62 % retrace . wave 1 went where to where ? and add 162% of that ,you get your estimated 5 wave top area. we can do that. failing any of those price points keeps NNVC looking down not up. Holding above 1.25 is the critical price point right now. breaking below 1.20 is the critical breakdown point. An elliott wave ABC down , or ABCDE down as a wave 4....is the only thing I havent looked precisely at to give you precise numbers. I think Ive done a decent job with this contribution here. maybe You could look at the elliott wave and blog it for us? If you think my analysis is 'all over the place' maybe thats just my writing style slaming home a point, I dunno. I dont think I was all over the place. I think I was right there front and center. Allan, what's your thoughts on TZA hitting 52 week low, at what price would you get back in?? This is one of the ETF's I monitor daily in the subscription service and will jump into when its trend models flip from Short to Long. I'll go long TZA when Daily Model flips long or when the 240 minute flips long, current reversal price is $8.50 for 240 minute model and near 9.00 for Daily Model. Stop then would be prior low? How many times have you seen this flip for a signal and then reverse immediately. Do you ever front run the signal?? Every new trend signal comes with it very own adaptive reversal level, which is always my stop, Signals reverse immediately on occasion, but the good news is that second signal, the immediate reversal, is usually very profitable and no, i never front run anything except maybe the Stanley Cup this year for the Red Wings who likely won't lose another game all season, including but not limited to the playoffs. thanks for the reference to the 240.